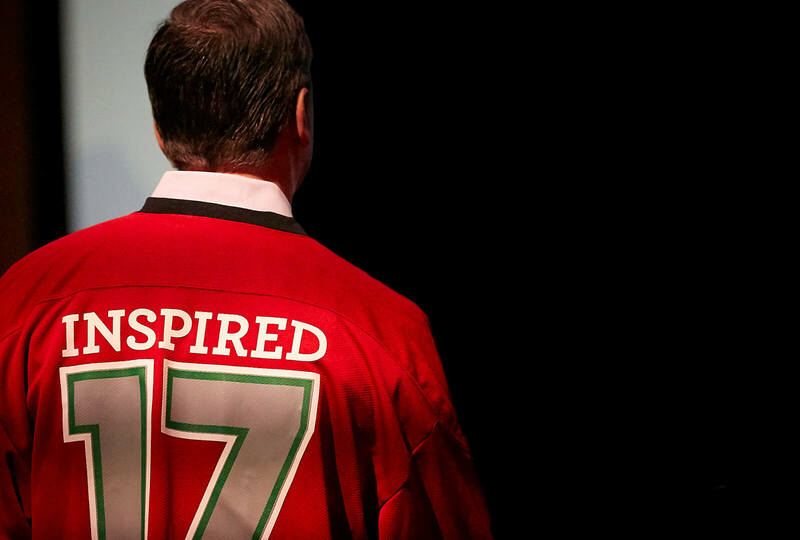 At 5 feet 2 inches tall, Laurie Anderson was swimming in the jersey that is being awarded to Hormel Foods employees who are—figuratively speaking—larger than life. So, she rocked it out with boots and leggings, giving it her own brand of style. 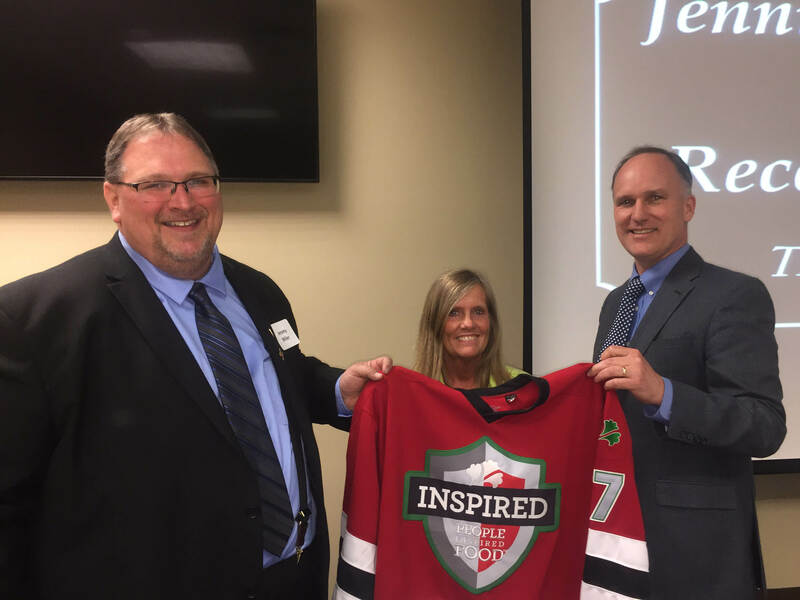 Jeremy Miller, HR manager, Jennie-O Turkey Store Barron Plant; Laurie Anderson, Pride of the Jersey winner; and Glenn Leitch, President, Jennie-O Turkey Store. Diving in and getting the job done—even when things aren’t a perfect fit—is what makes Laurie tick. 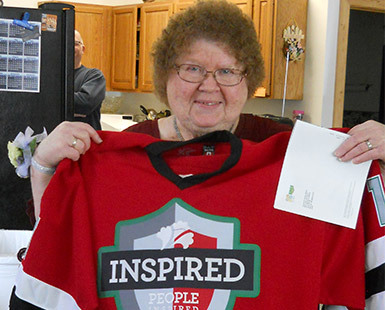 According to Glenn Leitch, the president of Jennie-O Turkey Store and presenter of her jersey, she is the embodiment of Hormel Foods values. 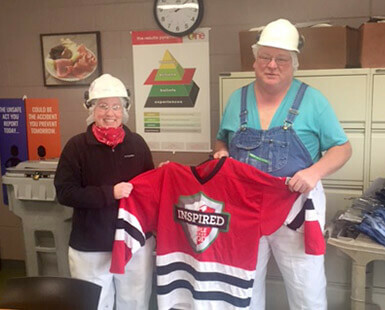 “Laurie, your performance and behavior over the past 25-plus years demonstrate what our cultural beliefs are all about—Results Matter, Create Solutions, Speak Up, and Build Bridges,” Glenn said, as he named the second Pride of the Jersey recipient at the Jennie-O Turkey Store Barron (Wis.) Plant. 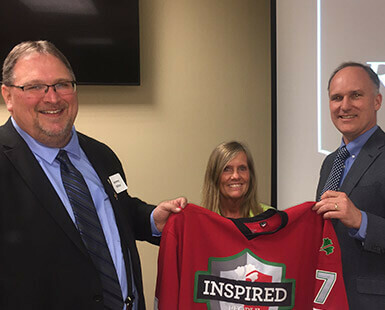 Laurie received the jersey at the location’s annual employee awards banquet, a celebration that she had a hand in planning again this year. Stepping in to pick up the slack when and where she’s needed are hallmarks of this long-serving employee who works in the mailroom and fills in as a human resources assistant on a regular basis. In addition to her already-full work day, Laurie has been driving a school bus for most of her adult life. The company has always allowed her the flexibility to do both jobs. That means that Laurie has played a role in the lives of more children than she can count. Laurie’s parents were born and raised in Barron, Wis. The family moved to Illinois when Laurie was a child and returned to Barron when she was in eighth grade. Laurie remembers hating the change even though she wouldn’t be anywhere else now. Barron is home. She admits she likes to stay busy. That notwithstanding, she always finds time for her kids and grandkids, most of whom live close by. Laurie is mom to two daughters and a son, and grandmother to six grandsons and two granddaughters, ranging in age from 1 year old to 23 years old. A waterpark in Wisconsin Dells, Wis., is a favorite outing for the family. Laurie gets an opportunity to dote on her grandkids and see them play together. “They get along well,” she says. Sharing her jersey with them was a highlight of her week of fame.